I am so going to see that movie. So I'm a bit behind and I need to read the book still, but I'm stoked about the Beastly movie. Sounds amazing and I love Mary-Kate and Neil Patrick. GONNA BE AWESOME. 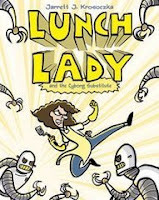 That's really cool about the lunch lady novel though, I love Amy Pohler. Love Kristin Bell! I used to watch Astro Boy when I was a kid. Not so crazy about Mary Kate Olsen. Ditto Nessie, re: both Olsen girls. OMG they're making Beastly into a movie!??! I had no idea - and that's one of my favorite books ever!!! Plus, I adore Neil Patrick Harris. This is going to be awesome! Flipped is being made into a movie?? That's gonna be so cute! !